This relationship is focused on marriage, partnerships, common efforts and public relationships. 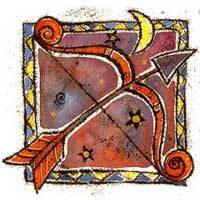 Next to Gemini you assume responsibility for your acts. You could tie yourself permanently to a Gemini. Mercury and Jupiter symbolize responsibility and reward. Gemini is quick, agile and versatile. He can help you turn your ideas into actions. 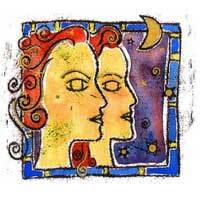 You feel attracted by Gemini even though your signs are in opposition. He thinks fast and likes to take notes, while you like to philosophize and could be characterized as a writer. There's a big difference here, but you have common qualities. At large, there are many similarities between you too. But if you analyze all the details you will notice the differences. They are restless and follow various trends. You are willing to travel but not for a long period of time and not being pressured by time. They raise your awareness regarding other people's reactions. Your ideas become more practical and they stick to the point. You have to be very energetic in order to keep up with them. You assume responsibilities duties and additional work. Marriage is a certainty in this case. In business you are very successful together and attract profit.